It is a tough climb to the weather station: The trail leads across snow-covered boulder fields and steep, icy slopes. But for four researchers from Kyrgyzstan’s Geology and Mineral Resources Agency, the six-hour climb to the Adygene Glacier weather station, perched at 3,600 meters above sea level, is routine. From there, they can monitor 18 growing lakes at the glacier snout in the mountains above Bishkek. The largest of these melt-water lakes is a potential hazard for the capital city, 40 kilometers down the valley, says the team’s debris expert, Vitaly Zaginaev. “The lake is dammed by an underground ice plug that usually thaws slowly and feeds the Ala-Archa River. If the temperature rises too fast, the ice melts rapidly and can cause a sudden outburst. The flood could develop into a mudslide, endangering not only the valley but possibly also Bishkek,” Zaginaev told EurasiaNet.org. Thanks to global warming, glaciers are retreating, new melt-water lakes are forming and the risk of so-called glacial lake outburst floods (GLOFs) is increasing, many scientists agree. Back in 2007, the United Nations Environmental Program classified GLOF's as “the largest and most extensive glacial hazard […] with the highest potential for disaster and damage.” But even before that, Central Asia was feeling their effect. In July 1998, more than 100 people died during an outburst flood in the Shahimardan Valley, which Kyrgyzstan shares with Uzbekistan. A similar flood in the Shakhdara Valley in Tajikistan’s Pamir Mountains in 2002 claimed 23 lives. In both cases, local communities did not receive early warnings and had no time to take emergency action. Today, tight budgets and bureaucracy are stretching Kyrgyzstan’s ability to prevent a similar disaster, one that could possibly strike the densely populated areas around the capital. When the ice holding back Teztor Lake in the mountains above Bishkek melted on July 31, 2012, the Geology and Mineral Resources Agency predicted it with precision. “Within just a few days, the water level rose by 16 centimeters," said Sergey Erokhin, head of the research group. But it took the Ministry of Emergency Situations (MChS) several days to release a warning after receiving notice from the scientists. “We informed MChS 10 days ahead but they didn’t start putting up warning signs and evacuating people until right before the outbreak happened,” Erokhin said. In a written response to EurasiaNet.org’s queries, MChS deputy head Davletbek Alimbekov credited the ministry’s emergency plan and warning system for averting fatalities and noted that no damage occurred. Local sources, however, reported thousands of dollars in material damage: several yurts were apparently flooded, and the mineral water pipeline to a commercial bottled-water plant was destroyed. In contemplating hazard-reduction measures, some point to Switzerland, a country with topography similar to Kyrgyzstan’s, as a model. In a case similar to Kyrgyzstan’s Teztor, Grindelwald Lake in the state of Bern burst out in 2008. The material damage was over half a million dollars. To avoid such a disaster in the future, government and local authorities implemented costly measures: For over $15 million, they built a drainage channel and several automatic monitoring stations. Probes constantly measure the water level during summer. If numbers exceed a critical threshold, sensors trigger an alarm in the valley. In addition, a dedicated website informs residents about changes around the glacier and the lake. “The probability of catastrophic lake outbursts is still small, but it increases with each new lake. This applies especially to high mountain regions such as Central Asia, the Himalayas, the Andes and the European Alps,” said glaciologist Wilfried Haeberli of the University of Zurich. 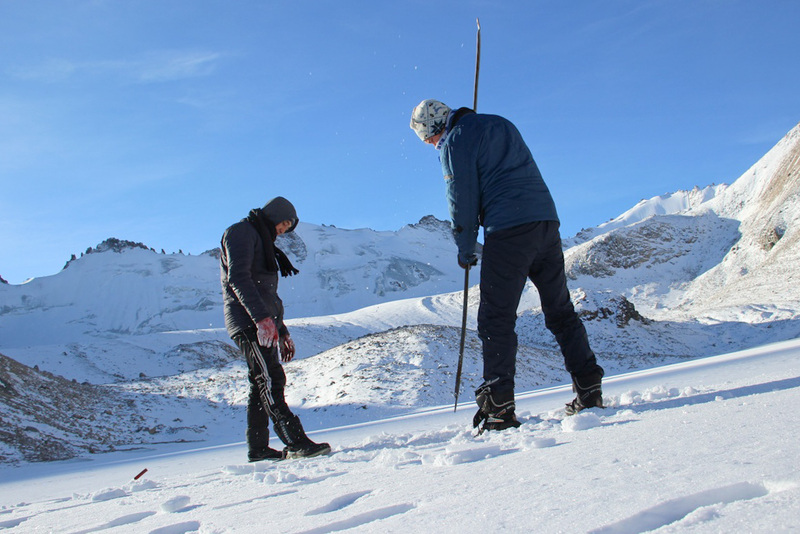 Haeberli and his team predict melting glaciers will form up to 600 new lakes in Switzerland this century. “We can quite accurately simulate where and when the new lakes will form. Therefore, it is possible to plan ahead and take early action,” he told EurasiaNet.org. Haeberli recommends preventative measures including artificially lowering a lake’s water level or building a reservoir dam to break the dangerous tidal wave (a rock slide can trigger a sudden “tsunami”). Early warning systems and emergency plans are important to evacuate people on time. Of course, impoverished Kyrgyzstan does not have resources like Switzerland’s. Kyrgyz scientists say they have the means to check on only a fraction of the 330 lakes around the country that Alimbekov of MChS says are prone to outburst this year, and only a handful of the 22 that are considered extremely hazardous. The six specialists from the Geology and Mineral Resources Agency monitor five of Kyrgyzstan’s seven provinces. In southern Batken (where the 1998 outburst that killed more than 100 happened) and Osh provinces no one is monitoring glacial lakes, they say. In this situation, Zaginaev and his team do the best they can. Each year, they pick the five most dangerous lakes, hike to them by foot and measure parameters like temperature, precipitation and solar radiation. “At least installing some automatic measuring stations would make our work a lot easier,” said Zaginaev. Adriane Lochner is a Bishkek-based writer.